A recent report by the Israeli news agency DEBKAfile has unleashed a torrent of speculations that China will join the Russian air campaign in Syria. DEBKAfile reported, that the Chinese aircraft carrier Liaoning-CV-16 docked at the Syrian port of Tartus, accompanied by a guided missile cruiser. The Chinese aircraft carrier passed through the Suez Canal on September 22. A squadron of Shenyang J-15 Flying Shark fighters is not there yet and is said to be transported from China through Kazakhstan, Iran, and Iraq, to be stationed partly on the Liaoning-CV-16 and partly on Russia’s Latakia air bases (Hmimim near Jable and another base which is not disclosed yet). According to DEBKAfile, the Chinese will also deploy Z-18F anti-submarine helicopters and Z-18J airborne early warning helicopters. 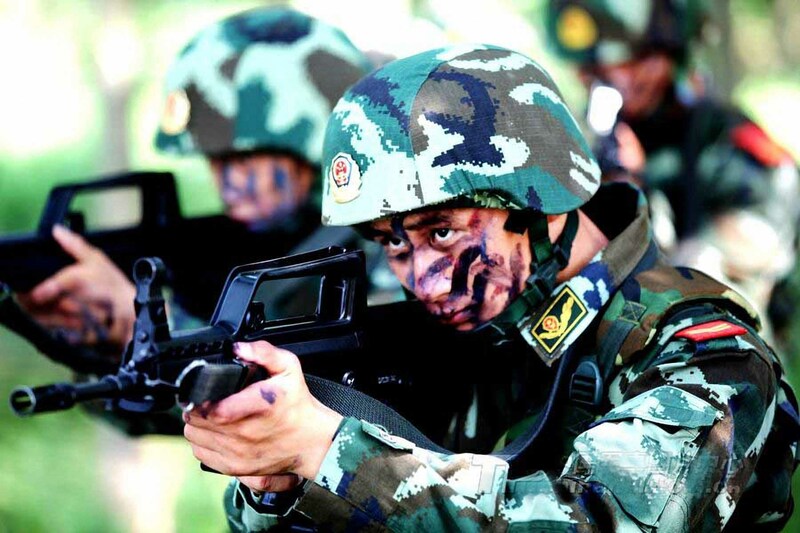 In addition, 1,000 Chinese marines will join the fight against Islamic rebels in Syria. The Chinese marines will try to seek out and eliminate Uyghur fighters from the predominantly Muslim northern Chinese province of Xinjiang. 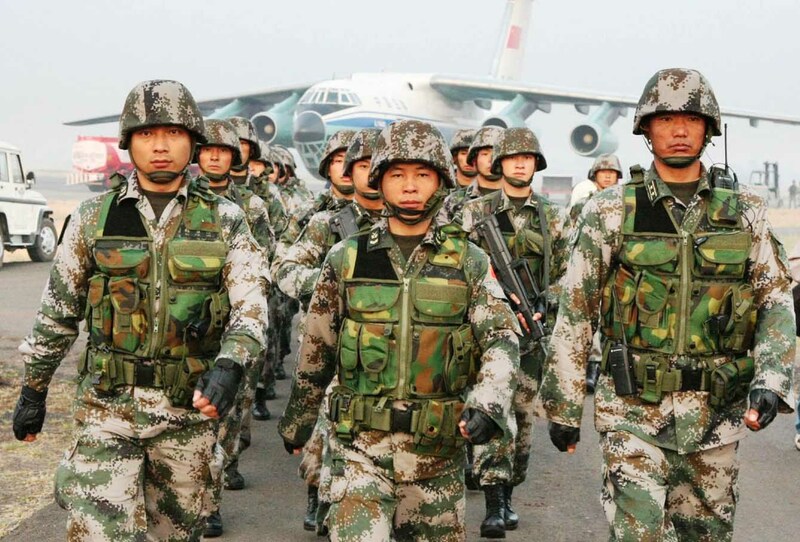 Al-Masdar News, citing an unnamed Syrian army senior officer, reported that Chinese personnel and aerial assets are set to arrive within weeks while other reports suggest that a large number of Chinese military advisers have already joined Russia’s personnel in Latakia province. Western naval sources reported, that a Chinese landing craft, the Jing Gangshan, with a 900-strong marine battalion has reached the Red Sea en route to the Mediterranean Sea. With a displacement of 19,000 tons, the amphibious warship is 210 meters long and 28 meters wide and can carry helicopters, armored fighting vehicles, boats and landing craft as well as nearly 1,000 soldiers. The Liaoning CV16 is Chinas only aircraft carrier, it originally was a Soviet-era Kuznetsov-class carrier which China acquired from Ukraine to repair and refit it at the Dalian shipyard in northern China. The deployment in Syria would be the carrier’s first taste of action in conditions of real combat. In Mai the Chinese navy’s 152nd fleet, consisting of the Jinan guided-missile destroyer, the Yiyang frigate, and the Qiandaohu supply ship, conducted naval exercises in the Mediterranean Sea together with Russia and Egypt. 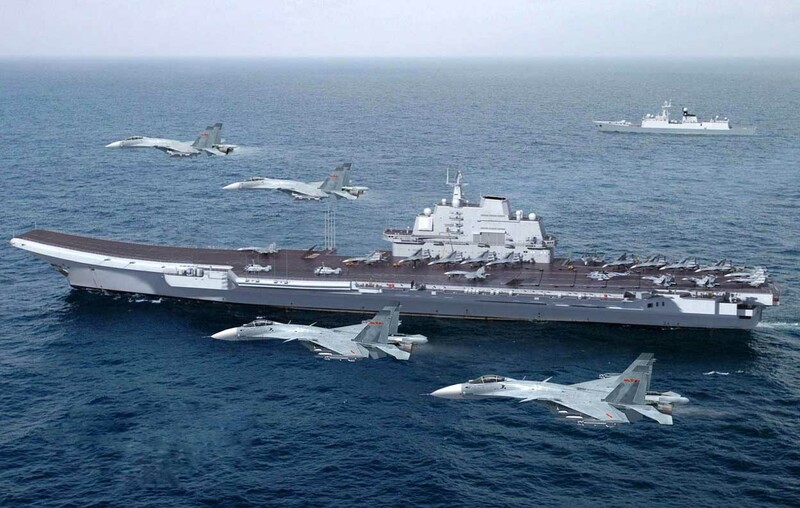 Bloomberg news asked then: “What is China’s navy doing in the Mediterranean?” Other US news channels voiced concern as well but nobody connected the exercises with an impending Syrian air campaign against Islamic terrorists. At the end of September, Chinese cargo ships carrying military equipment passed through Suez canal. The UCF 6, sailing under the Moldovan flag, departed from Shanghai at the end of Feburary and is since docked in Syria at Tartus. Chinas entry into the Syrian war would be entirely consistent with China’s position on Syria and the desire of its military to take a bigger role in international affairs. Beijing has for some time expressed its support for Damascus, most notably by vetoing together with Russia three UN Security Council resolutions drafted by Western powers. China has an interest in strengthening its military presence in the region to secure its economic engagements. China is building a naval base at the Horn of Africa in Djibouti, where nearly 10,000 soldiers shall be accommodated, and plans to post units of elite counterterrorism forces (Snow Leopard Commandos) in Iraq and Afghanistan. There are rumors that the Snow Leopard Commandos will also become active in Syria. It wouldn’t be difficult to integrate them into the antiterrorist campaign, because they have since long time trained together with Russian special units. China is already represented in the Middle East and Africa, because there are 1,000 Chinese peacekeepers under the UN flag in Lebanon, another 1,000 in South Sudan and 500 in Mali. In Africa, it has long been rumored, that workers and employees on Chinese sites are in fact military personnel. China has close ties with energy suppliers from the Gulf, primarily Saudi Arabia, but as Russia was not restraint by the economic interconnections with Turkey and Israel, China will probably also not be hindered by economic considerations. Especially so, because ties to Iraq are even more important than the relations to Saudi Arabia, UAE, and Kuwait. Beijing is Iraq’s largest foreign oil industry investor and its state-owned NPC (China National Petroleum Corporation) faces huge losses if Islamic State fighters control its operations. Iraq’s reserves are some of the world’s largest — a key reason for Beijing to get involved and protect its interests. Already in September 2014, Iraqi Foreign Minister Ibrahim Jafari said his Chinese counterpart, Wang Yi, offered to help fight IS (Islamic State) by launching airstrikes separate from US operations. China also has stakes in Syria’s oil industry — where NPC holds shares in two of Syria’s largest oil companies, while Chinese company Sinochem owns a 50 percent share in Syrian oil fields. At the moment China has abandoned its Syrian oil fields, which are under IS control. In the same way that Russia does not wish to see battle hardened and experienced Chechen fighters back in their home county, Chinese President Xi wants to prevent the Uyghurs from returning home from the Syrian battlefields. The Uyghur terrorist group Turkistan Islamic Party is very active in Syria and staged the massacre of 56 captured Syrian soldiers at the Abu Dhuhur air base. The Uyghurs have also been reported to fight with Jaysh al Fateh in Idlib and Homs. According to Al Mayadeen, a Beirut-based satellite news service, at least some of the abandoned villages in northern Syria are filling up with the families of Muslim Chinese Uyghurs. These Uyghurs, claims the report, are entering the country along with their wives and children to fight alongside Jabhat Al-Nusra and IS against the Syrian government. Uyghurs are actually a Turkic people, millions of whom live in western China. Though some Uyghurs look like Europeans, a lot of them have Asian features. They have sometimes been in conflict with the Chinese state; there were serious problems in China’s Uyghur-majority regions in 2008 and riots in 2009. In August Uyghur terrorists killed almost two-dozen people at the Hindu Erawan Shrine in Bangkok, Thailand. According to some experts, the entry of Uyghur fighters and their families into Syria is part of a Turkish plot to alter Syrian demographics. The Sunni rebels chase ethnic minorities like Christians and Yazidis out of their cities and villages in northern Syria, and these areas are then repopulate with jihadist Chinese Uyghurs, to be in the end annexed by Turkey. At the moment there are many claims and counterclaim and it is still unclear how intense Chinas entry into the campaign against Islamic terrorists in Syria will be. Good so, it shall be a surprise for the USA and NATO allies, as it was a surprise when Russia started bombing IS, Jabhat al-Nusra, Ahrar al-Sham, and their terrorist peers. This is btw. an interesting side-aspect of the story: The preparations in Russia and Iran for the Syrian campaign started already in June and for three month the USA didn’t have any clue what was brewing. Michael McFaul, former US ambassador to Moscow: “They did not expect the speed with which Putin ramped things up, he likes the element of surprise.” (!) The intelligence committees of the US Senate and House of Representatives are now examining the extent to which the spy community overlooked or misjudged critical warning signs. The Americans should send their NSA data collectors and CIA analysts home and resort to fortune tellers and tea leaf reading (cheaper and probably more accurate).